 Mouse anti Human CD11c antibody, clone CBR-p150/4G1 specifically recognizes human CD11c, otherwise known as integrin alpha X chain and leukocyte adhesion receptor p150,95, a ~150 kDa type I transmembrane protein and member of the integrin alpha chain family, expressed by monocytes, macrophages, granulocytes and NK cells, and is a marker for hairy cell leukaemia cells. CD11c combines with the CD18 beta chain (ITGB2) to form the leukocyte specific integrin CR4, acts as a mediator of leukocyte adherence to endothelium, and binds to the ligands CD54 (ICAM1), iC3b and fibrinogen. Mouse anti Human CD11c antibody, clone CBR-p150/4G1 inhibits the binding of CD11c to endothelial cells. Mouse anti Human CD11c antibody, clone CBR-p150/4G1 does not recognize CD11a, CD11b or CD18. Schack, L. et al. (2009) Osteopontin enhances phagocytosis through a novel osteopontin receptor, the alphaXbeta2 integrin. Corbi, A.L. et al. (1990) Genomic structure of an integrin alpha subunit, the leukocyte p150,95 molecule. J Biol Chem. 265 (5): 2782-8.